I love a good old desi party. Nothing beats the gupshup, food and the hospitality. This post is just for fun. It’s introspection and self-satire because I have been guilty of all of these at some point or the other. And sometimes I feel it’s important to say the obvious: this post isn’t targeted at anyone in particular. It’s a fun take on what I and all of us end up doing at a desi party (Read: please don’t stop inviting me!). 1.If the invite says 6pm, the guests will leave their house at 6.30 pm (who the hell wants to be the first one to arrive). The ones who arrive right at the end always explain by saying: “eik to apka ghar bohat door hai“. 2. 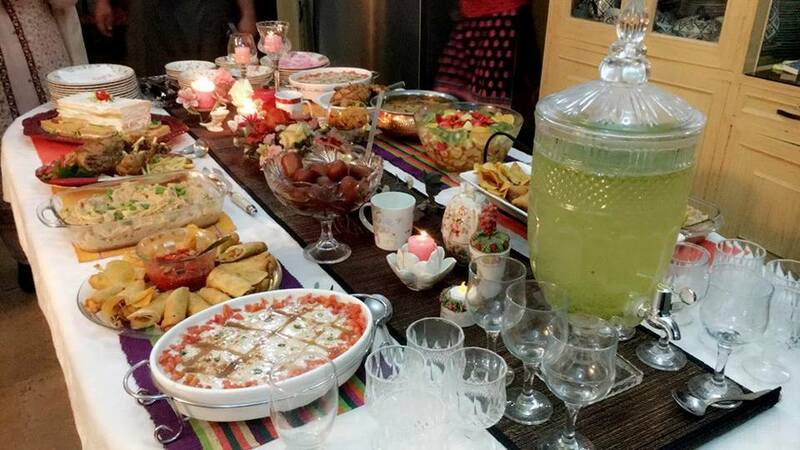 The punctual ones are left setting up the table or decorations as the host dashes to get ready thinking in her/his mind: “Itni jaldi kis ne anay ko kaha tha“. 3. Someone will not be able to find the house in this world of GPS navigation systems and smart phones. They will need directions to the likes of: “Chawk se doosra turn, phir pehla seedha, phir aatay jaen jab tak aap ko water ke tanky na nazar aye, wahan se right turn lena hai aur hamara ghar yo green gate wala hai jahan hamara kuta Moti bhonk kar aap ka istaqbal kare ga“. 4. As soon as the guests arrive, the men and women divide like Darya-e-Sindh mein se Ravi. The men join the men folk that discuss cricket, politics and their cars. The women join the women folk where the popular topics are the upcoming or just commenced Pakistan trip, school options for children or the weather. 5. The younger children are tossed back and forth between the parents. The older ones are left to survive on their own in the basement. The ones who make it alive are awarded a plate full of biryani. 6. You don’t need to remember any names. All men are Bhai. All women are Bhabi. Children can be called: choto, cuto, baby, gullo etc. 7. After taking lots of pictures and selfies, someone will comment: “Dekho Facebook per na dalna, nazar lag jaate hai“. 8. It’s all about the food. And the food is fit for a Valima party. There is always enough to feed three times the number of guests. The guests do full justice and are constantly encouraged by the hosts with well-rehearsed lines like: “dekhein apna he ghar samjheye ga, aap ke plate khali nahi hone chahiay, ye khaas aapke liay banaya hai, takaluf nahi karna“. 9. Someone’s child will break a glass and spill coke over a white carpet. While the hosts moan at the scene silently (smiling their fake smiles), the mother of the culprit will hug her child and console him/her ignoring any loss done by her laal. Afterwards she will offer to clean up the mess with a kitchen towel, tapping half-heartedly at the stain while eyeing the dessert, till the host steps in to clean it up themselves. 10. All children will decide to start crying collectively to convince their parents to leave, who will look at their watches and say: “oh itni dair ho gaye pata he nahi chala”. It would almost be midnight by then. 11.The last and most brutal stage is Khuda Hafiz that takes a full one hour. 12. Someone will forget their phone and return to claim it before the host has had the joy of going through their whatsapp chats. Previous Post Songs of the Morning! Next Post Pro Tips for Amazing Eid Photographs! But you forgot another topic among women: endless discussions about their clothes and jewelry (where to buy, whats in style, etc). Spot on! What about when the kids all get together and plan a sleepover at someone’s house so one set of parents end up taking more kids home than they arrived with! Our children are a little young for that but thanks for the headsup! Great connecting with you, will checkout your blog for sure! 🙂 Thanks for dropping by. Please add me on your mailing list. Hey tams, you should have mentioned that men are usually hell bound on solving all the political and religious problems in Pakistan. It seems like they know all the root cause and have almost best solutions to solve the problems there!! And then there are men who sit with the men but keep their ears cocked to the what the women are talking about, especially if the women are laughing their heads off. They suspect they are the cause of all the hilarity! And of course, men are always right !!!! Loved this blog and love the content on your site. Thanks Naima for dropping by and your feedback 🙂 keep coming back. Would love to stay in touch! It is hilarious and so true. Love reading your posts. What about all the wonderful gifts the host receives…. usually regifts or something they found in the basement thoughtfully stuffed in a dollar tree gift bag! Lol! So true , hilarious and funny. #1 hate it when people to do this or even worse if they come at 5.30. 6 means 6. #2 would rather have the host honor my time as well as theirs. #4 always a good idea. #7 hate the selfies and groupies. Low maintenance person and definitely not fb poster. #8 food is sometimes but cat stand the badsha ka dasterkhawan all the time. A simple gupshup and eat meanwhile wins my heart. #9and 10 children have a peculiar talent of being so! #11 oh so very true! #12 hence the password on the phone. Hahah! Loved your detailed feedback! Keep visiting! What about when you comment someone about there outfit, they have to tell you it’s this designer and that designe instead…..